There is a seeming contradiction in that you’re burning bright and are at your most attractive but you may be the least inclined to do anything about it. It really is up to you but I suggest you make your decisions consciously and ask yourself if you really are lacking interest. 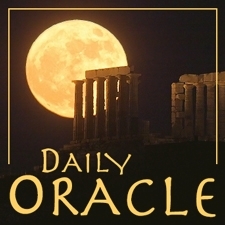 Today’s Oracle takes us to the Aquarius weekly for May 27, 2005. There is a seeming contradiction in that you’re burning bright and are at your most attractive but you may be the least inclined to do anything about it. It really is up to you but I suggest you make your decisions consciously and ask yourself if you really are lacking interest in what it seems that at the moment you don’t care for. You may need to peel back a layer or two and get at your real desires; if you can find them and remain aware of them they have a very good chance of being met. This could involve an amorous situation or a long-held-back creative desire that you’ve been thinking a lot about lately.